Precast pre-stressed solid floor slabs or wideslabs are manufactured using an innovative casting system ensuring a truly smooth soffit finish. Wideslab floors, supported on masonry or steel structures can be used in domestic, commercial and industrial applications. 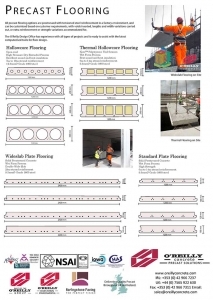 Solid wideslab is often referred to as “plate flooring” and is generally used in residential developments. Wideslab flooring contains an internal strand which facilitates notching and the forming of openings. Modular width of 2400 reduces the number of joints and erection time. A lattice girder can be used, which increases the spanning capabilities of the unit and robustness of the flooring system.